After adding only a single bird to my species year list (the Heermann's gull) in July, I knew I would be hard pressed to add any more species in August. But with Dave recently adding the black redstart and little owl to his European year list, I just had to follow suit! There was no better way to do than with the sighting of a single Cassin's auklet (215) today. 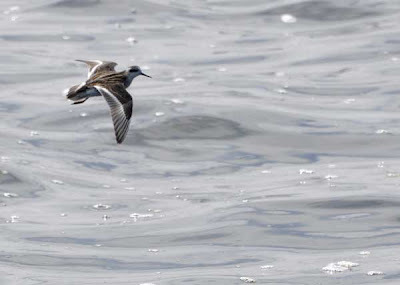 I only had the briefest of looks, but there's no other small, stocky charcoal-colored sea bird that it could have been. What a great find! 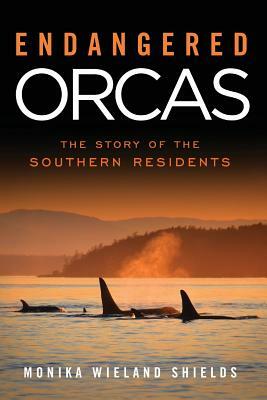 I'll have to look for more of them next time I'm out there. 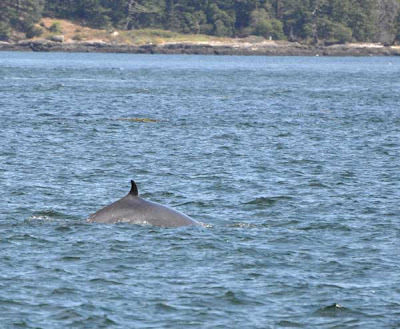 As we looped back towards San Juan Island we were successful in picking up a minke whale, but it was living up to it's name as a slinky minke and we didn't get the best of looks as it zig-zagged around in the choppy water. 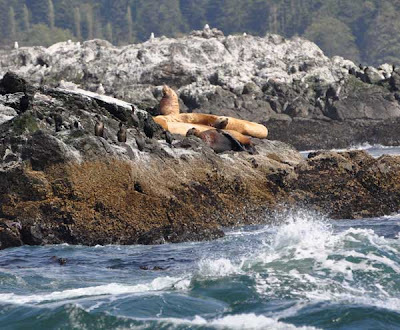 After watching it for three or four sets of surfacings, we headed back towards Cattle Pass where a half-dozen Steller sea lions were hauled out on the rocks. We have now been seeing these guys regularly for the last week, so it appears they are "back" for the winter - a good month earlier than normal! I wonder if these are some males that weren't as successful breeding this year and decided to hit the foraging grounds early? 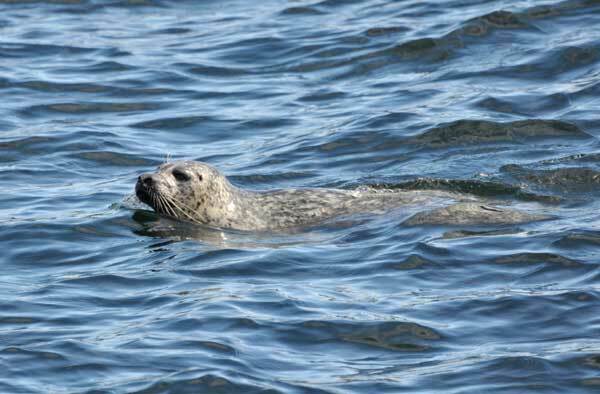 Or perhaps with the increase in the sea lion population they are simply expanding their range - that would be nice! Whatever the reason, it is good to see them. By the way, check out that water in front of the sea lions! The waves in Cattle Pass were pretty impressive on the incoming flood tide, looking more like river rapids than anything else as they often do in that area. 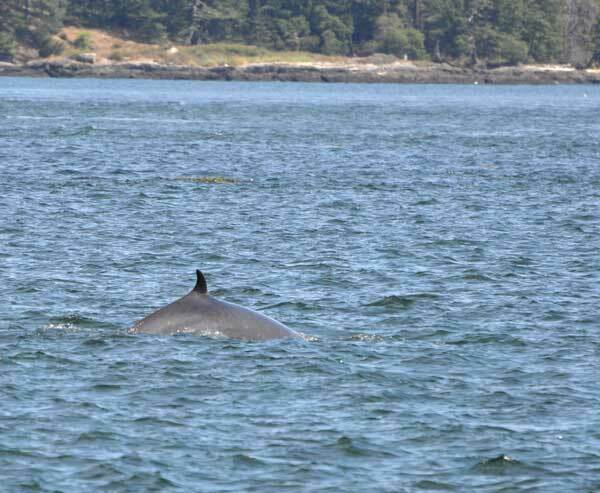 Before heading back to Friday Harbor we got a report of another minke whale, this time in the calmer waters of San Juan Channel. 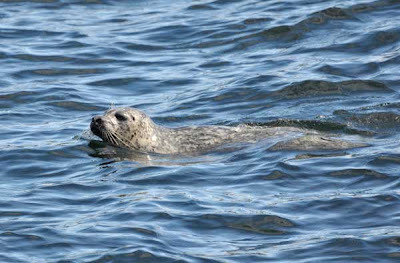 We got much better views of this animal, which was also larger than the first minke whale we saw. 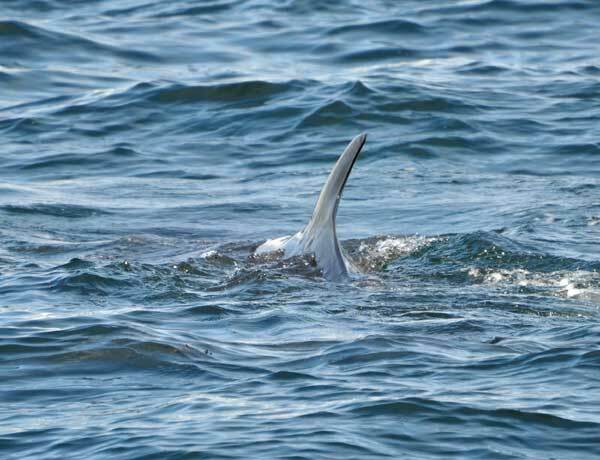 On its last surfacing before we had to leave, the minke came up just off the port side of the boat, close enough that we could hear it breathe! 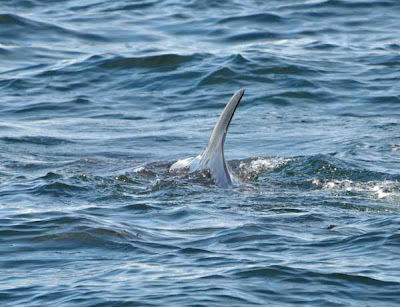 It's not often you get this view of a minke, looking from behind it directly at its dorsal fin - cool! Today was one of those days where the orcas were just out of reach for us, but on the other hand we saw lots of other great birds and marine mammals so it was still a fantastic trip.